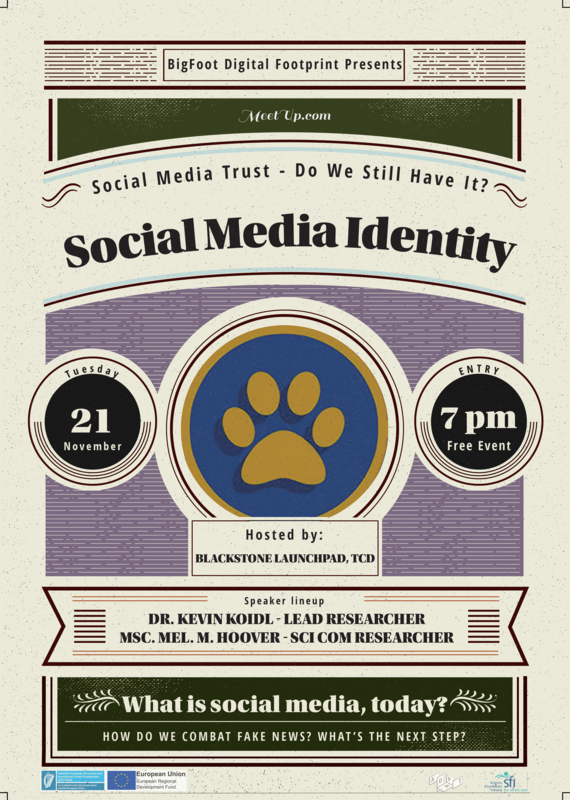 Social Media Trust – Do We Still Have It? We think trust is now lacking in our social media circles. Meaning, perhaps our friends, our social network isn't being so honest to us. How do we see Fake News? Through posts and shares. When are we challenged with the notion, maybe that isn't so true? When we're online... Are our social media networks being honest with us? Are we with them? 1. What is Social Media these days? 2. How can I understand my digital footprint? Join, Dr. Kevin Koidl as he discusses these new questions. The internet was never supposed to be a complicated space of monetisation, commercialisation, personalisation. So, why do we the citizens allow these occurrences? There will be a special presentation on a controversial, social media experiment conducted on real users to test fake news. For more information and read further details, follow this link. For conversations during the presentations, be sure to use the hashtag: #SMIdentity and #BigFootDigital @bigfoot_digital on Twitter and BigFoot Digital Footprint on Facebook. A link to BigFoot Digital Footprint's MeetUp page can be found, here.